The Salar de Uyuni salt flats in Bolivia are the largest in the world, covering an area of over 10,000 square kilometers. ?The huge expanse of salt stretches as far as the eye can see, and really does feel like another planet. 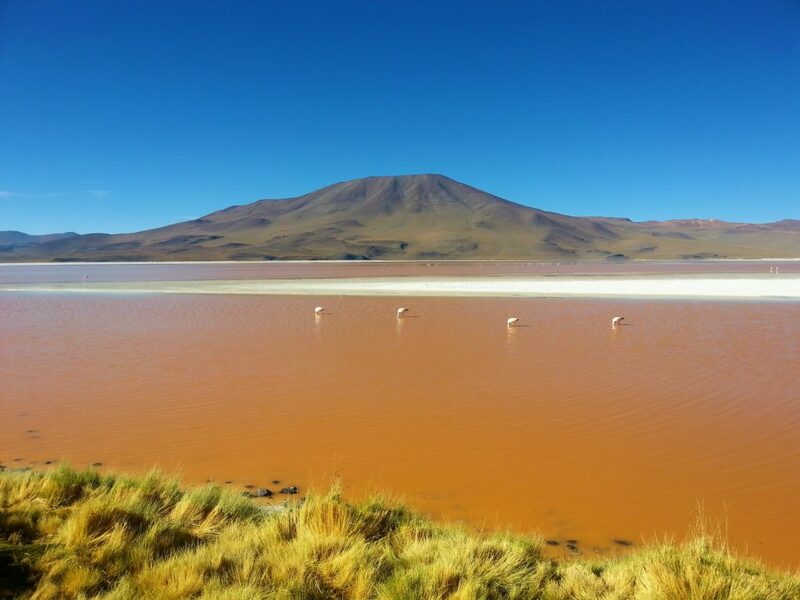 ?To reach the salt flats from southern Bolivia, we crossed through sandy deserts, saw snow-capped mountains and eerie colored lagoons. ?The salt flats are incredible, but the scenery throughout the journey was unreal. ?Was this still Earth? ?I wasn?t sure. 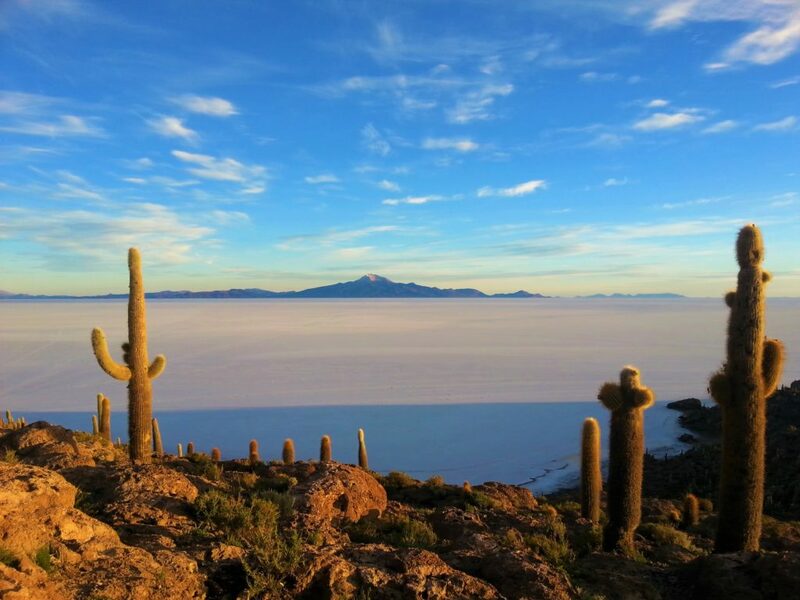 The altitude in this region of Bolivia can reach over 4800 meters above sea level, so the air is thin, and I was often out of breath as my lungs struggled to take in enough oxygen. ?It was cold too, despite the sunshine, and we were bundled up in layers to keep warm ? we could have been wearing spacesuits to protect us from the harsh environment! 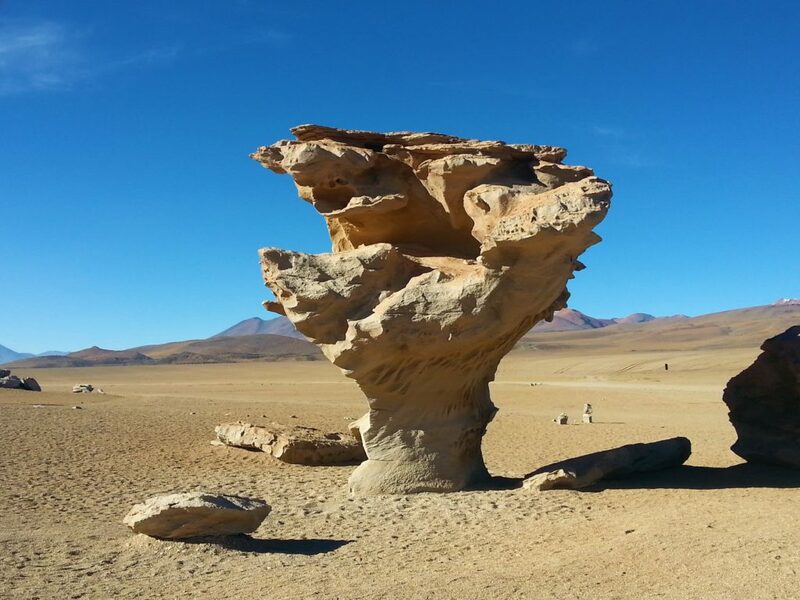 In the deserts, we found bizarre rock formations, molded by the wind and sand. 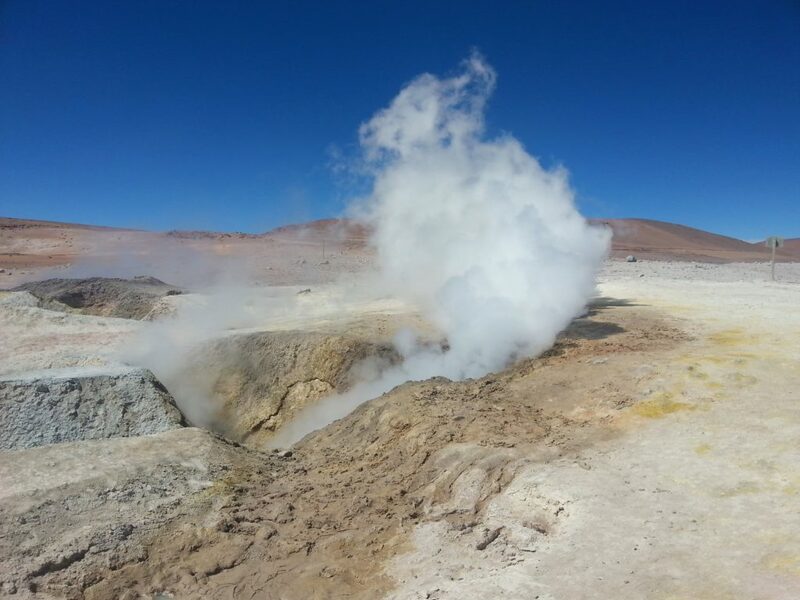 ?Elsewhere, geysers spewed their steam and noxious gases into the air. ?We came to a series of beautiful colored lagoons. ?One was red, another white, and another was deep blue with swathes of white salt creating islands that appeared to be frozen. This strange land wasn?t barren though, plenty of animals had made this bleak landscape their home. ?Flamingos fed in the lakes, and we saw vicu?as (delicate, llama-like creatures), and even a couple of ostriches. ?Nature finds a way to survive, even in the most inhospitable places. We spent the night on the edge of the salt flats, in a hotel made of salt. ?We left before dawn, driving miles across the flats in the dark, with only the stars to guide our direction. ?Then, in the middle of nowhere, an island rose up out of the salt. ?Covered in cacti, this oasis in the desert of salt was a beacon of hope, where we saw the sun rise and the white salt around us was bathed in a warm glow. 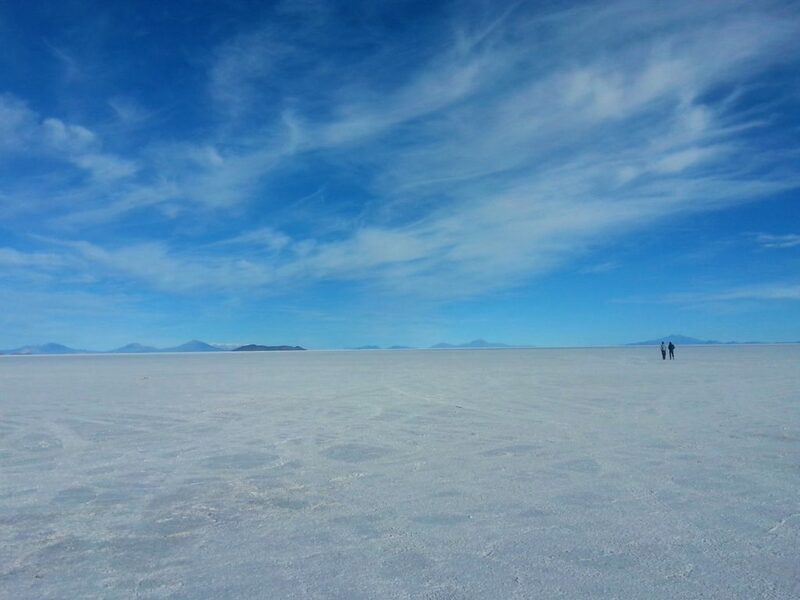 On the salt flats, all sense of perspective and proportion is lost, as there is nothing around you for miles. ?I?d never been anywhere so flat, so white, and so strange. ?The salt crunched underfoot, it was almost like snow or ice below our feet on a frozen planet. 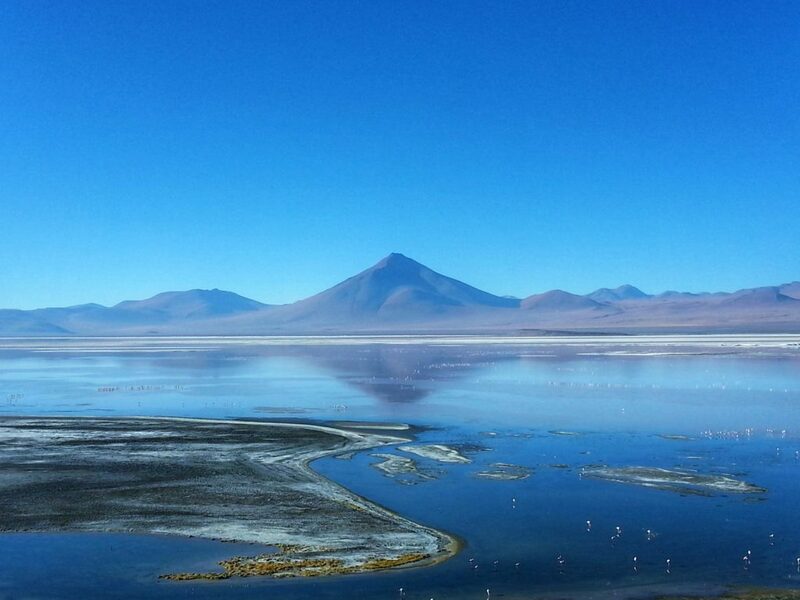 The Salar de Uyuni is like nothing I?ve ever seen before. ?I felt humbled, awed, and incredibly small after seeing such an extraordinary, unearthly place. Claire is a solo traveler and writer specializing in Latin America and European destinations. Her blog Tales of a Backpacker is designed for travelers on a budget who are willing to splurge on amazing experiences, as she aims to seek out the best food, drink & experiences in a destination without breaking the bank.